The Jenny Evolution warmly welcomes Becky of Railroad Wife, Mommy Life as our guest blogger this week. Interested in being a guest blogger on The Jenny Evolution? Click HERE to connect with me. 2. Because he was 4 months old. I’m not saying 4 months is too young to fly, take them at 3 1/2 months or 5 months but for the love of all things holy, stay home with your new 4 month old. The 4 month old sleep regression, the grumpiness, the clinginess, the growth spurt-ness! That is a whole different story, we went anyway! He was actually fabulous on the plane. It was just all the in between that made me want to bang my head against the wall. After our “vacation” to Georgia, David had another training the following month and I decided to take Noah and the dog to Michigan alone. I drove through the night, per usual, and it wasn’t terrible. I was pretty much a travel pro at that point. So when the opportunity arose to go to Florida, I jumped on it. By opportunity I mean, I saw that my in-laws had a week saved up on their time share! I thought, “15 hour car ride? Totally doable!” For me of course because I will be sleeping peacefully in the back. Or jumping out of my seat watching Harry Potter the whole way down. Either or. We leave tonight on our big trip so I will be sure to update when we get back but these are my travel tips to date! 1. If you haven’t guessed my number one tip, it is drive through the night! If you have to drive (which I prefer just because I like to not have to worry about what I pack), drive when the baby is sleeping. Easy peasy. 2. Try not to over pack, even though I usually fail at this. It’s a biggie when flying. The hardest part about our flight was being complete pack mules through the Atlanta airport. Of course we go to one of the biggest airports ever loaded down with so much stuff we could barely move. The image of David walking to our gate carrying the stroller, car seat, diaper bag and his laptop bag is forever burned into my brain. 4. Skip the car seat base when flying. Just make sure to look up how to properly install the car seat without it before you go. 5. If you are traveling with a baby younger than 5 months, take a Rock ‘N Play. If you know me, I think babies should sleep in those magically devices until they try to throw themselves out. It was great when traveling. We took the cover off and put it in our luggage and covered the frame with a huge free plastic bag at the airport. It got slightly scuffed but it was one of my many Craigslist deals so no biggie. You do have to go to over-sized luggage for it when you get to your destination so be sure to know where it is. 6. Carry on your pump! Do not let it out of your sight. I took this and the diaper bag as my carry on and personal item. 7. If you are taking breast milk with you, tell security before you even start the whole production. They take care of you right away and you get to skip ahead. 8. Try to feed/nurse baby on take off and/or landing. I timed it so that Noah ate on the way down but our flight got delayed on the way home and he wasn’t hungry and he still fell right to sleep. I made sure to offer a paci just in case his ears hurt. 9. Wear your baby. I thought it would be better to keep Noah in the travel system but they make you fold up the stroller and put it through X-ray so, it’s easier to wear baby and load up that stroller with luggage. 10. Relax and have fun! Easier said than done right?! 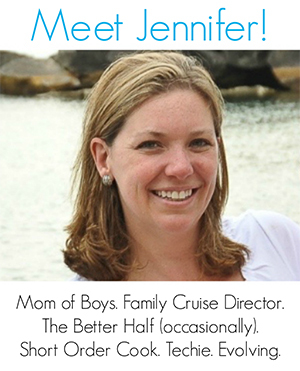 Thanks to Becky of Railroad Wife, Mommy Life for being our guest blogger this week. Becky is a lover of coffee, shopping, movies, food, babywearing and all things outdoors. You can read more on Railroad Wife, Mommy Life. Interested in being a guest blogger on The Jenny Evolution? Click HERE to connect with me. Wearing is a “must” for me! It made traveling so much easier with my boys. When I could wear my kids, I would. Now they’re too big. I echo your thoughts on driving at night, although what we used to do when our kids were small as leave at like 3 am, this gave me a good 4 or so hours of driving while everyone was sleeping. Once they were up, quick stop for breakfast then back on the road. It usually worked pretty well and I maintained my sanity. Thanks, Karen. I hope they help you out next time you’re traveling. Wrote a post with my own toddler traveling tips, too. Wholeheartedly agree with the babywearing. It is a lifesaver! Babywearers unite! My husband and I did that until our kids just got too big. Ditto the baby wearing! My toddler is 2 1/2 and we’ve only flown with him twice but it was a lifesaver! We prefer to drive if possible. We go to Florida every February and we have driven the last two years. I find it much less stressful and I like being able to drive at night too! I’m always surprised more people don’t hitch their kids up to them. It really does save one’s sanity. I have been so, so, so lucky with the exception of one child getting sick mid-flight, our travels have been smooth. KNOCK ON WOOD I hope I didn’t just jinx myself. These are great tips you’ve shared! Baby wearing is the way to go. I’ve traveled with both of my boys across the globe and one of them has always been in my Ergo. That is until they got to big and broke my back as the 4 year old started to do. Ha! One thing to note- if you wear your baby through security they will have to swab your hands to test for residue. This usually takes only an extra minute or two, but you should plan on it. For me it was so much easier to wait that minute or two for them to check my hands than to get my baby out of the Ergo and then back in, especially if he was sleeping. We head to Spain in a few weeks and the baby will be strapped back on again. Happy travels everyone! I love baby wearers! Why more people don’t do that, I’m not sure. It certainly saved our sanity until my boys got too big to carry. Isn’t flying with a baby fun (enter sarcasm here)? I actually just wrote a post about my own tips for traveling with a baby (flew about 20 times before my little guy was 6 months old) and have some very similar tips. Ha! Great minds must think alike, Britni. And I’m impressed you’ve flown that much! I probably traveled about every 2 months the first two years with my first one. Some great tips here – I have also travelled on a plane a few times with my under-two, and tips like this would have been great! It’s amazing what you don’t realise til you’re right there in the middle of it. I wish someone had written these out for me when my kiddos were born. I had to learn a number of these the hard way. These sound like really great tips – anything that helps parents through the journey is welcome! Emily, We’re not going to stay home so we may as figure out how to make the travel as smooth as possible, right? These are great tips for parents with small or young children. Thanks, Christy. Sometimes it takes other parents to try out things to make it easier for the next set. Great advice! When our kids were little, traveling at night was a life saver for keeping them content in their car seats! Thanks for sharing your traveling tips at Friendship Friday! We still do driving at night to help out with our school aged kids. Completely agree! I’m not even going to bother with the stroller next time, we just ended up pushing it around empty as little one preferred to hang off my arms instead. At least in the States they normally return the strollers at the gate, most European airports don’t give them back until you’re through security! I have to say I don’t miss the stroller when traveling at all!